I've been wanting to watch SWatH for a long time and I was curious about Mirror Mirror as well. As a fairy tale lover, I'm always excited to see different interpretations of them and see what new angles can be added to so well known stories. Now that I've watched both of them, I can say that I was surprised by one of them and completely disappointed by the other, even though I went into watching them without expectations. 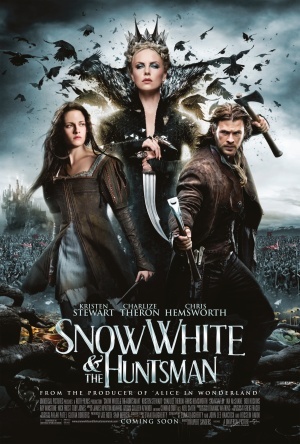 Snow White and the Huntsman was a very boldly changed story with a fascinating touch of a medieval era. It was very, very different from the original one and I oddly liked it. Yes, it was a bit over the top with its dramatic atmosphere, but it was an unique inerpretation and quite captivating, to be honest with you. I found myself wanting to know more and wonder where and how it would end. 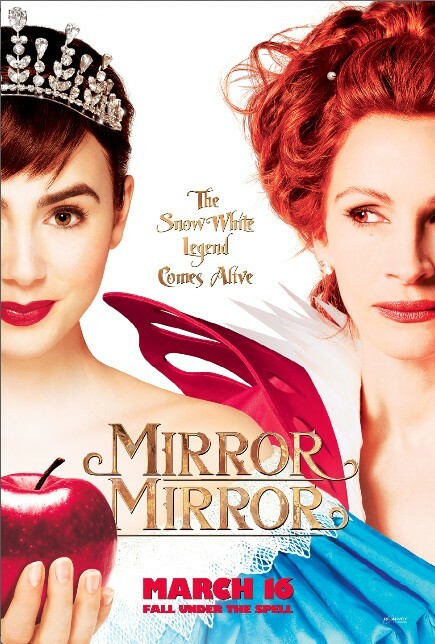 Mirror Mirror, on the other hand, was a huge disappointment, because I realized it's probably targeted to 10 year olds and even though I'm also fan of Pixar and their work, I was just unimpressed by this whole ridiculous joke that was MM. I liked the "giants" which was probably the only thing I enjoyed other than how beautiful Lily Collins looked, but everything else was so freaking meh. At one point I even doubted if I could finish watching it. I'm not saying SWatH was amazing and the best movie I have ever seen, but compared to MM it was by far better out of two and if I were to recommend you either of them, my choice would be clear as cristal water. It was odd watching Julia Roberts do an English accent while Theron's sounded so much better and more vicious. Plus, Roberts was a bit old for a queen that's originally supposed to be goddess-like. Sorry, Julia, this one goes to Charlize, Pretty Woman was filmed ages ago and even the prettiest of us gotta grow old some day. The figting scenes were also better in SWatH. Oh, do I even have to mention how ridiculously hot Chris Hemsworth looks? Well, if anything else didn't seal the deal for me, than this man would. He brought roughness and attitude to an otherwise so dark and twisted story. Last but not least, I'm looking forward to seeing Lily in TMI: City of Bones (Btw, have you seen that teaser trailer?? If that was a teaser, then what in the world does the real trailer hold for us? I couldn't be more excited), but this just didn't work for me. I'm sorry, Lily. Kristen, even though you're not known to many facial expressions, you were kind of better than in Twilight, I'll give you props for that, although your English accent was completely ridiculous. So to conclude this comparison, I would recommend you to watch SWatH rather than MM if you're bored out of your mind and want to get a taste of cool fantasy effects and enjoy a story not targeted to ten year olds. If you're a Mom wanting to watch a movie with your kid, then it's best to probably pick MM, because it may give you a few giggles and I think your child won't know how bad this movie really is. You, on the other hand, will most likely not ejnoy it. Sad, but true.